What do Benjamin Franklin, a beloved children’s author, a renowned Hollywood director and a Santa Fe paper engineer have in common? Find out at 1 pm on Sunday, January 19, when Andrew Baron talks about his restoration of an 18th-century Maillardet automaton. 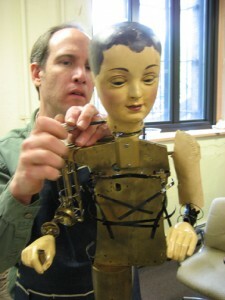 The mechanical device (at left with Baron) was a key inspiration for Brian Selznick’s Caldecott Award-winning book, The Invention of Hugo Cabret, which led, in turn, to Martin Scorsese’s 2011 Academy Award-winning movie, Hugo. Baron’s lecture and a showing of the film are part of the annual commemoration of Benjamin Franklin’s birthday (January 17, 1706) by the Press at the Palace of the Governors. The event, in the History Museum auditorium, is free with admission; Sundays are free to NM residents. Automata—mechanical marvels that mimic the movements of humans and animals—were all the rage in France during Franklin’s ambassadorship there. One can easily imagine the great inventor, writer, printer and statesman visiting exhibitions populated with mechanical acrobats, musicians, mice, caterpillars, and singing birds. The Maillardet automaton, a bilingual android that penned poetry and drew exquisite pictures, was among the next generation of automata and was by far the most advanced mechanical writer-draftsman of its time. Conceived and completed between 1790 and 1800, it later survived at least one catastrophic fire before eventually landing at the Franklin Institute in Philadelphia. There, after an intensive life of exhibition, it fell into disrepair. In 2007 the institute asked Baron to evaluate it. Over a 12-day marathon, he brought it back to life less than a mile and a half from where Franklin lies buried in the Christ Church Burial Ground. Baron, a Santa Fe paper engineer—a pop-up artist in layman’s terms—is by many estimates something of a mechanical genius. Since childhood, he has repaired and restored everything from old clocks and wind-up phonographs to typewriters, cash registers, music boxes, vintage radios and even antique cars. The Library of Congress and the Edison Museum in Fort Myers, Fla., have sought out his expertise. His latest work is a kinetic invention drawing set into the cover of a new best-selling book, The Art of Rube Goldberg. For more information about Baron’s restoration of the Maillardet automaton, including photos and his full report, log onto www.popyrus.com/hugo. The Franklin Fiesta begins with a showing of Hugo at 1 pm. The two-hour movie will be followed by a short intermission. Baron’s 45-minute talk will begin at 3:30. The Franklin Fiesta is sponsored by the devotees of Benjamin Franklin at the Press at the Palace of the Governors, along with the Center for Cultural Technology (a collaboration of the Department of Cultural Affairs, Americorps and New Mexico Highlands University), and the Maker State Initiative of the New Mexico State Library.